The role of the diet is a key factor in the prevention of dental disease. By reducing sugar intake, especially in between meals, we can substantially reduce decay and other medical problems. The problem is that sugar is hidden in many foods. Working together, with a commitment from you, good tooth brushing, a sensible diet and high quality dental care from our dental team, it should be possible for you to have a healthy, comfortable decay-free mouth forever. Sugar plus plaque causes decay. Frequent intake of even small amounts of sugar is harmful. Sugar in a balanced diet, eaten at meal times is generally OK.
Sugar is not required for extra energy if you have a balanced diet. Tooth decay is caused by the interaction of sugar and dental plaque (the sticky film of bacteria on the surface of the teeth). Dental plaque forms continuously on the tooth surface. Each time sugar enters the mouth it is converted into acid by plaque bacteria. Acid attacks the teeth for 30 – 60 minutes after each meal or snack. Continual snacking on sugary foods and drinks greatly increases the frequency of acid attack and is much more likely to lead to tooth decay. There are no hard and fast rules on how many times a day people can safely eat and drink sugars without damaging their teeth. Sensible advice for most people is to limit their sugar intake to meal times only. These may still contain enough sugar to feed the plaque bacteria and in some cases can contain large quantities. 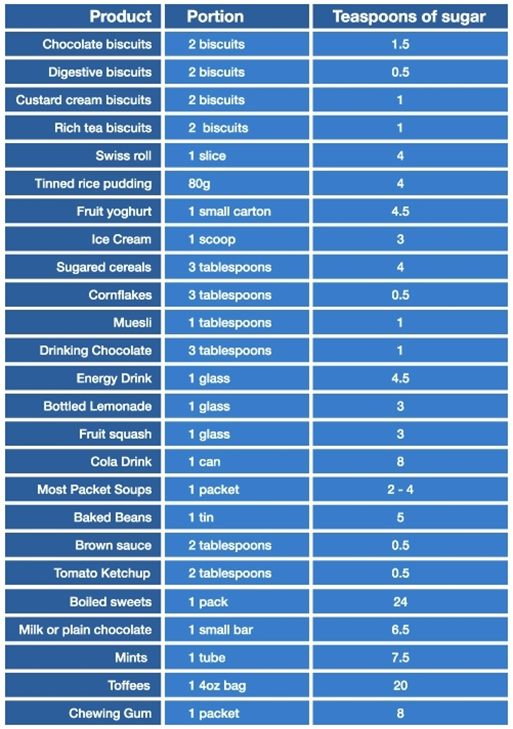 These are all sugars – it is easy to be mislead by the manufacturers. To help maintain a healthy mouth remember these simple rules. Limit sugary foods and drinks to meal times only. Brush your teeth with a fluoride tooth paste at least twice a day.